Add glass noodles to a bowl with cold water and let soak for approx. 10 min. Drain and cut noodles into desired length. Add noodles to a pot with hot but not boiling water and let soak for approx. 1 min. more. Drain and set aside. Peel and dice garlic and ginger, slice Thai chili and add to a bowl. Add soy sauce, sesame oil, a squeeze of lemon juice, a pinch of sugar, and ground coriander to taste, to the bowl and whisk to combine. Cut carrot into spaghetti using a vegetable spiralizer and transfer to the bowl. Add glass noodles to the bowl and stir until fully coated with sauce. Add cashews to a pan and roast until fragrant. Cut scallion into thin rings using the scissors. 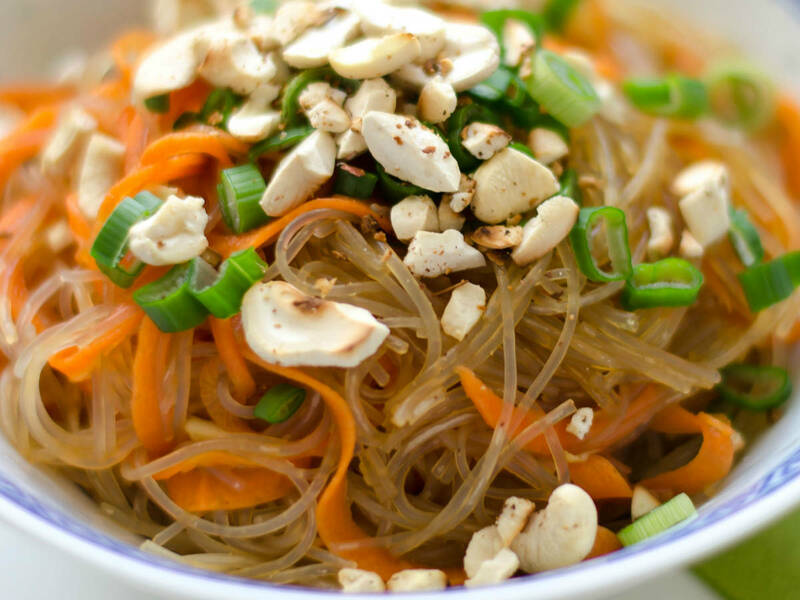 For serving add glass noodle salad to bowls, top with cashews and garnish with scallion rings. Enjoy!